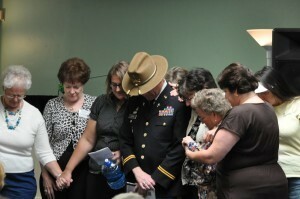 Ladies from the recent retreat for Grace Brethren women in California gather around to pray for U.S. Army Chaplain Billy Graham and his wife, Robyn. The couple spoke as part of the retreat, which was held in Murietta Hot Springs. This past weekend, November 5-7, 2010, 161 women from the Southern and Northern California Grace Brethren churches came together in Murietta Hot Springs, Calif., for a joint women’s retreat. The theme for the weekend came from Psalm 34:8, Taste and See that the Lord is good. There were 123 ladies in the English sessions and 38 in the Spanish sessions. Sharon MacMillan of Tracy, Calif., kicked off the weekend on Friday night with a session devoted to worshipping our Lord through music and scripture, which included a worship team made up of ladies from several of the attending churches. The remaining speakers for the weekend were from five Grace Brethren churches and included Cora Sykes of San Diego, Calif.; Claudia Todd of Whittier, Calif.; Connie Cashman of Bellflower, Calif.; Chaplain Billy and Robyn Graham of Ft. Irwin, representing the Eagle Commission; and Lois Shirk of Ripon, Calif. Rosa Churchill and Vicki Johnson led the Spanish sessions which included Pastor Al and Maria Ramirez and Sonia Perez as their speakers.